These days the line between work and play in the classroom is becoming blurred. It has been proven that children learn better and faster when learning is associated with play. As a result, many interactive games are found in learning apps. 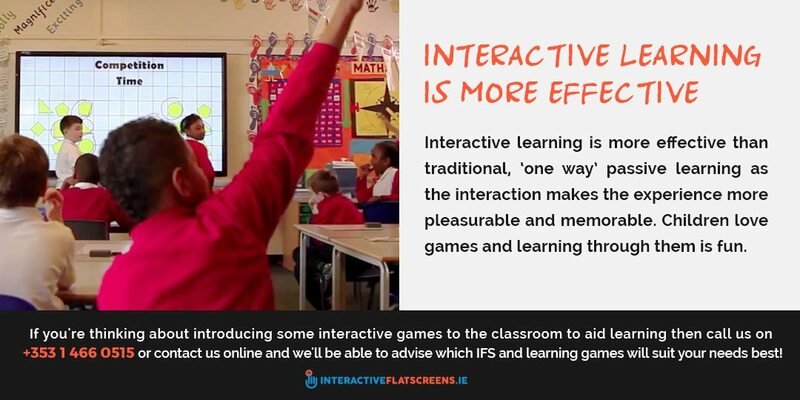 Interactive learning is more effective than traditional, ‘one way’ passive learning as the interaction makes the experience more pleasurable and memorable. Children love games and learning through them is fun. The classroom of the future will not be a place of slog and boredom. It will be a place of joy and mental stimulation, a place where imagination is rewarded not repressed. Some people think that all this fun and games will lead to a breakdown in discipline. The opposite is true. Much unruly behaviour is caused by boredom, therefore making learning more interesting and fun through interactive games will help to remedy this kind of behaviour. A good example of an interactive learning game is hangman. This traditional word game can be used to help pupils learn another language such as German or French or Latin. Another interactive game is the virtual historical tour. This allows the pupil to explore a period of history. By the end of the tour the pupil should be able to answer questions about the period and location he has just been exploring. For younger pupils it is a far more effective way of learning history than out of a book. This kind of exploration game will also be associated with home computer games that involve the player searching (and often shooting their way through) a virtual world. In fact, the home computer console is also good for growing and learning. For very young children it helps to develop and improve hand-eye co-ordination. This is through using the control pad to manipulate your onscreen persona e.g. Lara Croft from the Tomb Raider games. Home gaming also helps to develop problem solving skills. In order to get to the next level of the game the protagonist must often complete a task or get past a difficult obstacle which requires more than just shooting everything that moves. Also, home gaming can be good for a child’s self-esteem. Winning is always a good feeling. As long as it isn’t done to excess, home gaming is perfectly healthy. The interactive nature of it means that it is better for a child’s mind than TV. Whether it is at home or in the classroom games can have a very positive affect on the growing mind. 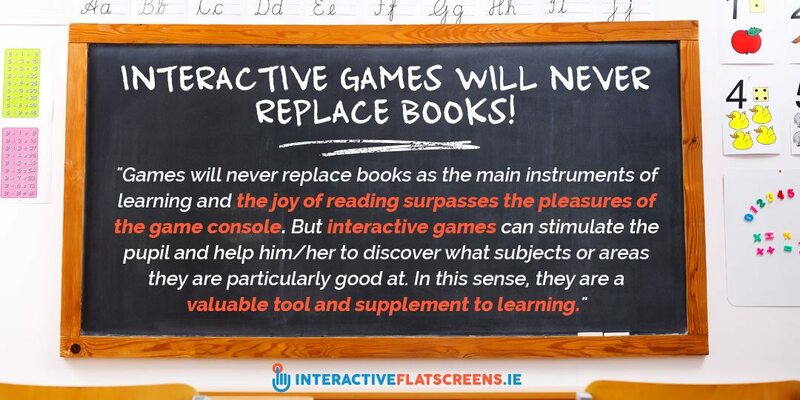 Of course, games will never replace books as the main instruments of learning and the joy of reading surpasses the pleasures of the game console. But interactive games can stimulate the pupil and help him/her to discover what subjects or areas they are particularly good at. In this sense, they are a valuable tool and supplement to learning. 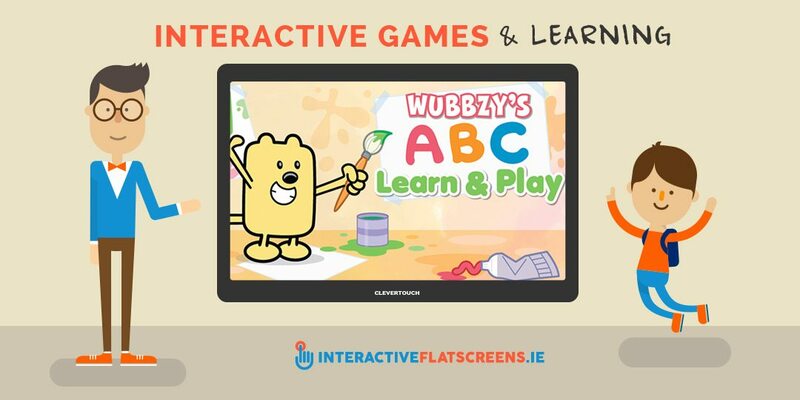 If you’re thinking about introducing some interactive games to the classroom to aid learning then we’d recommend considering a CleverTouch Interactive Flat Screen as the perfect medium for the interactive games. We have a range of Clevertouch screens available and if you call us on +353 1 466 0515 or contact us online we’ll be able to advise which will suit your needs best!